Might as well get one started. Limerick 3/10 in the Bookies for this one. Have we any hope? We always have a hope! Last week’s victory over Tipp will have boosted our confidence no end! But it will be a difficult one! Limerick are the top team in the land right now. Will give Kenny a good marker heading into the championship! Really no reason why the games couldn’t have been played at 2pm and 4pm on Sunday. The extra 30 minutes would make a lot of difference to people wishing to attend, having been at club games in the morning. I don’t like the idea of us having (and using) a 2nd kit when it really isn’t needed. It’s going down the soccer route, in my view, and is really just about selling more replica jerseys. If we have a genuine clash of colours, fair enough. But we don’t. Win win game here. Loose against the best team in Ireland by a mile and no harm done, be a good learning curve. I think we will be competitive alright. Thurles will have given us confidence. It’s a step up, but we beat Limerick in championship and league knock out under Ger Cunningham. We did lose another league quarter final in Parnell under Cunningham playing terribly, and the less said about the match in the Gaelic Grounds last year the better. Point is the current squad have beaten Limerick before in knock out matches which is a positive although Limerick have gone up a few levels since. We generally play well enough in Nowlan Park as well. Some exceptions to that also. Trying to find the positives! We have a chance all be it an outside one. don’t fancy the new dark kit at all but hey if they win in it …!! I’d like hurlers to have different gear and their own identity. I think that’s what it’s about actually. There is more to it then just a marketing thing I think. I am not sure what I think about it though to be honest. The hurling fraternity in Dublin is small, we need to leverage the wider GAA support within the county. Apart from that, I’m not mad on the jersey itself - but if they won an All Ireland in it, I assume I would get very fond of it! Hedgo and Ryan seemed to do very well when they came on (both Ryans points looked lovely). a) if Rushe is fit, does he start? b) to start with Ryan and Hedgo or bring them on again. 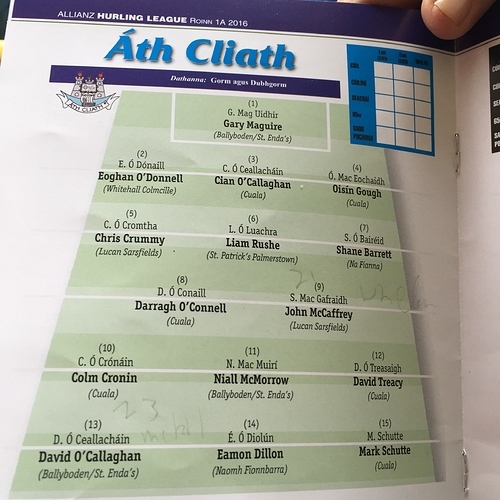 c) Is there anyone else now fit, that needs game time (Keaney, Schutte, Hayes etc). So I think there are two many unknowns to try to predict a team. I’d be delighted with only losing by 3. If we are only 3 points off the AI champions (who are flying it), it’s not too bad. Although, a win wouldn’t shock me. But it being Dublin hurling, every possible outcome is possible. That’s possibly the most obvious thing ever posted here. This was the team 3 years ago in Nolan Park when we lost to Kilkenny. Am I right that only O’Donnell, O’Connell and Dillon from Saturday’s team started that day.